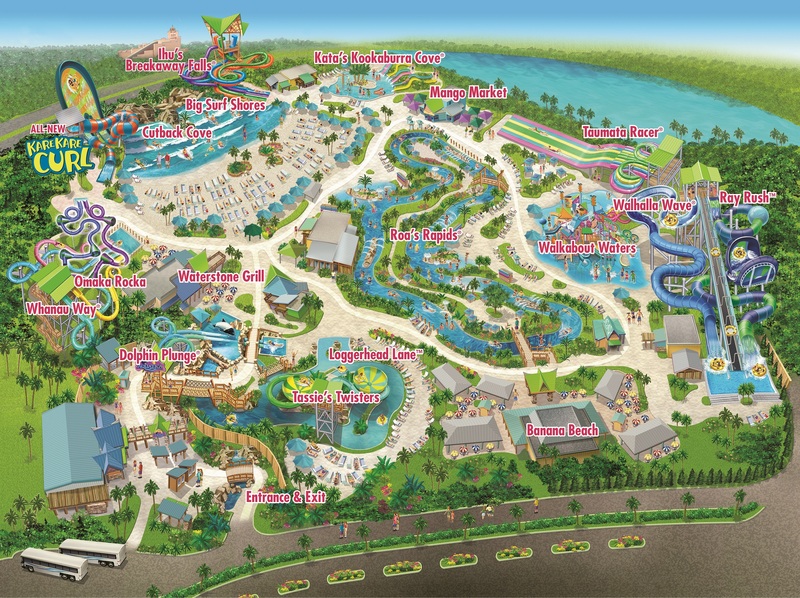 Aquatica has become the first waterpark in the world to be a Certified Autism Center. Click here to download our Sensory Guide, which is a resource for guests with cognitive disabilities including autism spectrum disorder. Our opening times vary between 9:00am – 6:00pm. Times are subject to change depending on the season. Check here before you travel. Aquatica is located across the road from SeaWorld, on International Drive. Aquatica is approximately 10 minutes south of downtown Orlando and 15 minutes from Orlando International Airport. 5800 Water Play Way, Orlando, Florida 32821. Looking for great value? Looking for great choice? Enjoy one entrée, one side or one dessert and one regular size non-alcoholic beverage every hour until the park closes. Choose from BBQ Chicken, pulled pork, BBQ ribs, personal pizzas, speciality wraps, salads, kids meals, and delicious desserts. Mango Market has a great variety of sandwiches, salads, loaded fries, chicken tenders and hot dogs. Also enjoy a variety of fruit, desserts, snacks, sweet treats, soft-serve ice cream and coffee. Choose from chicken sandwiches, hamburgers, speciality wraps, salads, kids meals and delicious desserts. Plus ice cold beer and assorted Coca-Cola products. What should I wear at Aquatica? Aquatica is a family experience, therefore we ask that appropriate swim attire be worn throughout your visit (i.e. no bathing-suit thongs, please). Cotton shorts or shirts, sport shorts, cover ups, loose fitting articles, or similar items are not permitted on body slides. Swim wear with buckles, rivets, or any sharp objects are not permitted on body slides. Check each ride's entry sign for specific restrictions. For the health & safety of all of our guests, children in diapers are required to use waterproof protectors. Are you allowed to wear Aqua shoes in the park? Yes, aqua shoes are allowed in the park and on the rides. We also sell them inside of the park. Aquatica provides United States Coast Guard (USCG) Type III life vests in a variety of sizes and Type II for infants free of charge throughout the park. Only USCG Type II or III life vests may be worn. Floatation devices such as noodles, arm bands, puddle jumpers, in-suit floatation devices, personal swim rings/floats and boogie boards are not permitted. Can I wear goggles on the rides? Swim goggles are permitted and may be purchased in several of our gift shops. Can I take my camera on the water rides? Personal cameras are not permitted on water slides or tube attractions. How do I redeem my All-Day Dining Deal? Exchange your paper ticket for a wristband at Banana Beach Cook-Out. Coolers are permitted, but they must be no larger than 16-quart size; large insulated bags are available for purchase at Guest Relations. For guests with special dietary requirements a limited number of daily picnic size lockers are available for rent at the park for $5 (plus a $5 refundable key deposit). Two picnic areas are located at the bus drop-off area at the front of the park and guest may re-enter these areas as often as they would like during an operating day. • Picnic lunches or other family portion servings (such as large bags of crisps bigger than 3.5 oz, sandwiches, hot dogs, slices of pizza, subs, fried chicken, etc). • Any outside beverages except bottled water (this includes teas, sodas, alcohol in any size containers). • Glass containers of any kind are not permitted. Is there anything else which isn’t allowed in the park? For the safety of our animals, plastic straws, balloons, and cup lids are not permitted inside Aquatica. Self-service all-day rental for a small locker is $10 and large locker is $15. Three Self Service Rentals are located throughout the park: by Ihu’s Breakaway Falls next to Kata's Kookaburra Cove, near Walkabout Waters across from Adaptations gift shop and at our Main Locker location across from Kiwi Traders gift shop. Picnic lockers are available at the front gate and must be rented from a ticket booth. Picnic lockers are also all-day access and are $20 + a $10 key deposit. Prices are subject to change; please check park for updates. Wi-Fi is available and free of charge for all guests. Simply search for the Aquatica network upon arrival at the park. How can I book a private cabana? To book a cabana and make your day that extra bit special, please click here. How does Aquatica cater for disabled guests? Aquatica is committed to providing a comfortable experience for all of our guests. The wave pool beaches are sand; however, the remainder of the park has paved pathways. All rivers and family attractions have beach entries (no steps). The park has five attractions designed with towers that do require stair climbing. The stairs are accessible by current ADA guidelines. Wheelchairs will be available for rental (first-come, first-served).